Nakashima T, Pyykkö I, Arroll MA, Casselbrant ML, Foster CA, Manzoor NF, et al. Meniere's disease. Nat Rev Dis Primers. 2016 May 12. 2:16028. [Medline]. Durland WF Jr, Pyle GM, Connor NP. 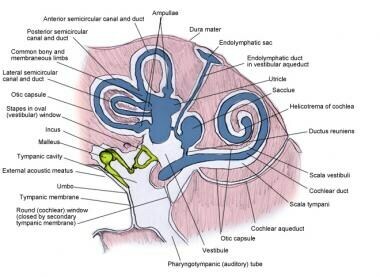 Endolymphatic sac decompression as a treatment for Meniere's disease. Laryngoscope. 2005 Aug. 115(8):1454-7. [Medline]. 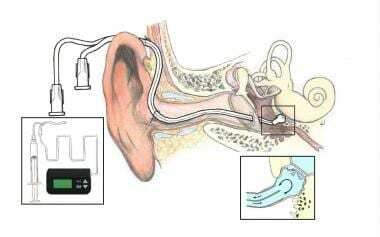 Light JP, Silverstein H. Transtympanic perfusion: indications and limitations. Curr Opin Otolaryngol Head Neck Surg. 2004 Oct. 12(5):378-83. [Medline]. Gabra N, Asmar MH, Berbiche D, Saliba I. Endolymphatic duct blockage: quality of life assessment of a novel surgical technique for Ménière disease. Eur Arch Otorhinolaryngol. 2016 Oct. 273 (10):2965-73. [Medline]. Kim SH, Ko SH, MD, Ahn SH, Hong JM Won-Sang L. Significance of the development of the inner ear third window effect after endolymphatic sac surgery in Meniere's disease patients. The Laryngoscope. Gianoli GJ, Larouere MJ, Kartush JM, et al. Sac-vein decompression for intractable Meniere's disease: two-year treatment results. Otolaryngol Head Neck Surg. 1998 Jan. 118(1):22-9. [Medline]. Glasscock ME 3rd, Jackson CG, Poe DS, et al. What I think of sac surgery in 1989. Am J Otol. 1989 May. 10(3):230-3. [Medline]. Kato BM, LaRouere MJ, Bojrab DI, et al. Evaluating quality of life after endolymphatic sac surgery: The Ménière's Disease Outcomes Questionnaire. Otol Neurotol. 2004 May. 25(3):339-44. [Medline]. Monsell EM, Wiet RJ. 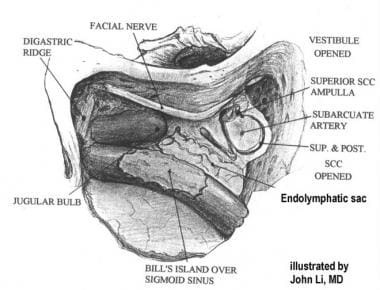 Endolymphatic sac surgery: methods of study and results. Am J Otol. 1988 Sep. 9(5):396-402. [Medline]. Bretlau P, Thomsen J, Tos M, et al. Placebo effect in surgery for Menière's disease: nine-year follow-up. Am J Otol. 1989 Jul. 10(4):259-61. [Medline]. Kitahara T, Kondoh K, Morihana T, et al. Surgical management of special cases of intractable Meniere's disease: unilateral cases with intact canals and bilateral cases. Ann Otol Rhinol Laryngol. 2004 May. 113(5):399-403. [Medline]. Shea JJ Jr, Ge X. Streptomycin perfusion of the labyrinth through the round window plus intravenous streptomycin. Otolaryngol Clin North Am. 1994 Apr. 27(2):317-24. [Medline]. Pyykkö I, Ishizaki H, Kaasinen S, et al. Intratympanic gentamicin in bilateral Menière's disease. Otolaryngol Head Neck Surg. 1994 Feb. 110(2):162-7. [Medline]. Sargent EW, Liao E, Gonda RL Jr. Cochlear Patency After Transmastoid Labyrinthectomy for Ménière's Syndrome. Otol Neurotol. 2016 Aug. 37 (7):937-9. [Medline].